Pancreatic cancer is, by nature, an aggressive and deadly disease with mortality closely paralleling incidence. The relative 5 years survival rates are as low as 8%, which falls to 2% when diagnosed at a distant stage . This is due to the status quo of patients being diagnosed when the cancer has metastasized, commonly to the liver, lung and/or peritoneum, coupled with the fact that the belligerent disease is rather resistant to chemo- and radiotherapies. Although risk factors such as smoking, obesity, family history, diabetes, life style, diet, lack of exercise, etc. have been identified as some of the factors predisposing to the disease, the exact causation is still to be elucidated [2, 3, 4, 5]. The resistance to current therapies is conferred to the characteristically dense stroma associated with pancreatic tumors. Recent studies propose that the stiffness of the extracellular matrix stroma provides a hindrance to blood vessel perfusion and presents a barrier to drug delivery to cancer cells . Pancreatic cancer is categorized into two types– tumors arising from the exocrine gland (adenocarcinoma, constitutes 95% of all pancreatic cancers) and from endocrine gland (often called islet cell tumors or neuroendocrine tumors, constitute 5%). Exocrine tumors tend to be more aggressive with poor prognosis and survival rate. Pancreatic Ductal Adenocarcinoma (PDAC) is the most common cancer, constituting nearly 90% of all pancreatic cancers. Surgical resection continues to be the only definitive treatment for PDAC, yet, the fraction of patients who have tumors that are amenable to surgical resection is only approximately 10–20% . Molecular aspects of pancreatic cancers such as key genes responsible for driving cancer progression have been studied well and are still undergoing research [8, 9, 10, 11, 12, 13]. Lack of clinical progress on pancreatic cancer when compared to other cancers slowed down the development of novel and effective therapies. The generation of a massive stromal tissue, which in some cases can make up to 80% of the tumor mass, is an archetypal feature of PDAC . 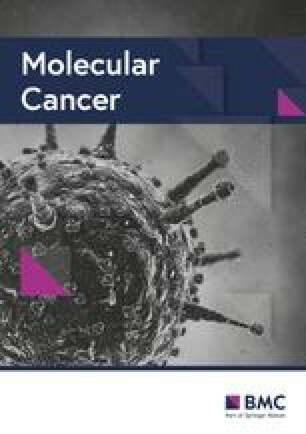 The tumor stroma of PDAC has both tumor suppressor and tumor promoting capacities [15, 16]. This concurs with the presence of a staggering milieu of cells in the tumor microenvironment (TME) such as regulatory T cells, immature monocytes, dendritic cells, mast cells, natural killer cells, neutrophils, cancer-associated fibroblasts (CAFs), pancreatic stellate cells and tumor-associated macrophages (TAMs). This heterogeneous population and its interactions with tumor stroma contribute to the ambivalence of the latter towards tumorigenesis. Contribution of the microenvironment to the tumor progression is essentially a novel perspective to identify new therapeutic targets. In this context, pancreatic cancer is known to have a dense complex stroma containing fibro-inflammatory mixture along with extracellular matrix, nerves and blood vessels. 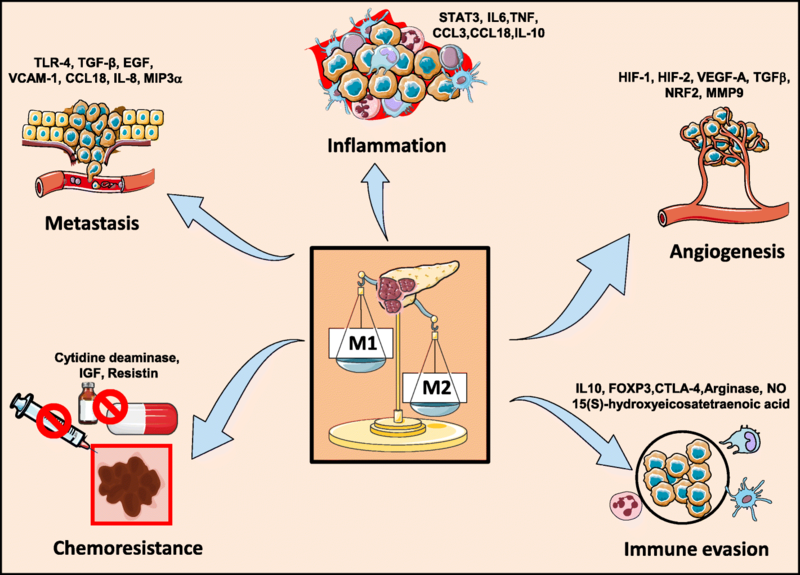 Recent studies already highlight the paradoxical roles of M2 macrophages and their distribution in the tumor architecture which determines the poor prognosis in pancreatic cancer . 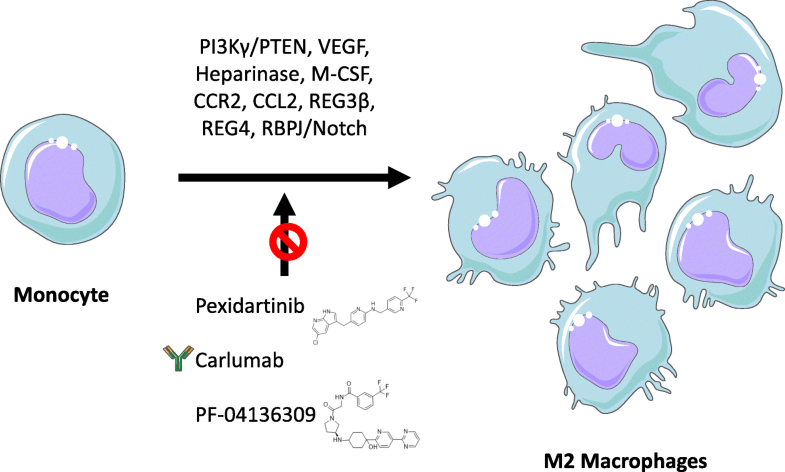 Hence, immunotherapy coupled with molecular targeted therapy (e.g. against DNA repair genes) is a promising regimen which could yield improved outcomes rather than using relatively outdated cytotoxic drugs in pancreatic cancer .